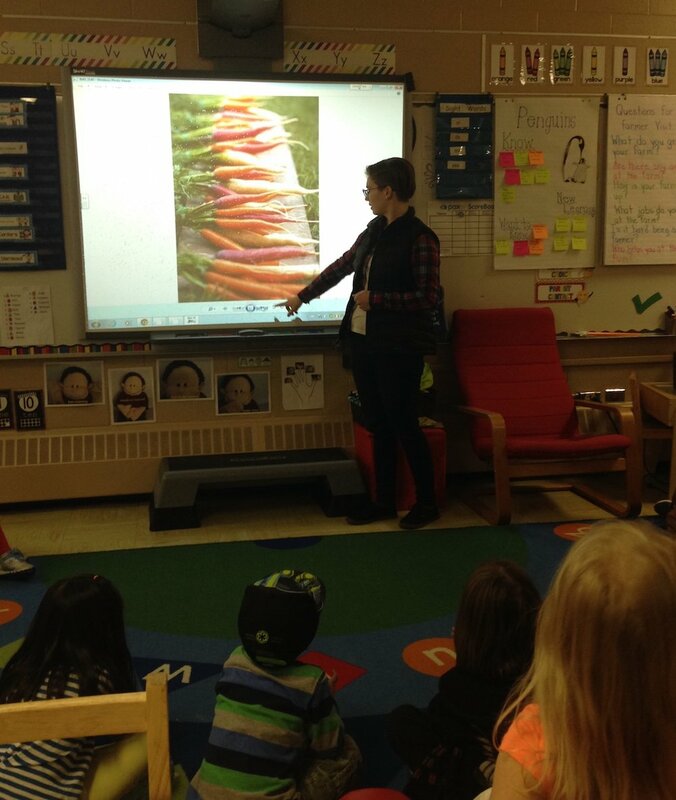 Today some lucky Little Green Thumbs classes had a chance to talk to a young farmer about her market garden. Sarah Preston of Bumble Beets Farm shared her story and showed photos of her ½ acre farm where she grows about 45 varieties of vegetables and takes care of 5 beehives. Sarah developed a passion for gardening as a small child and had the opportunity to experiment with plants and learn alongside her grandparents. In 2014, she decided to start a small CSA (community supported agriculture) and supply healthy organic veggies to 5 families. Last year, she had 25 members and also sold her vegetables at the Farmer’s Market at Salisbury Greenhouse in Sherwood Park from June to early September. Sarah grows lovely purple, white and orange carrots, and surprises her customers with beautiful golden zucchini. She also sells a lot of snap peas, large head lettuce, dill, beets and beans. The children learned how she grows purple kale to reduce damage from the caterpillar of the cabbage white butterfly that likes to munch on green plants in the cabbage family. The green caterpillars can’t camouflage well on purple kale and therefore the butterflies tend to lay fewer eggs on the colourful plants. Sarah also grows wildflowers to attract beneficial insects and provide food for pollinators. The students got to touch and smell a piece of honeycomb and see photos of Sarah’s beehive, her only animals on the farm, other than some cats and a dog. The children were surprised to learn that the dog and cats get along very nicely on the farm. Sarah was very pleased to see some of our indoor gardens. Many classes have already harvested lettuce and kale. At A. Blair McPherson School, about 90 students received a “fairy salad” in a little cup. Some of their Tiny Tim tomatoes are now ripe and they will be making “fairy pizza”. As a farmer, Sarah now returns to her important work of planning the crops and preparing for her upcoming growing season. Thank you for your stories and time, Sarah!